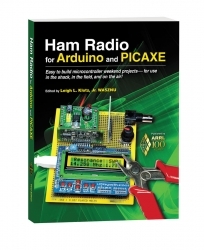 Our new book from the ARRL, Ham Radio for Arduino and PICAXE is nearly here. The book is a collection of projects by active, dynamic amateur radio operators, and ready for you to use with your Arduino, PICAXE, or Atmel microcontroller. Choose from the Arduino, ATTiny, and Picaxe for your project. See the official book companion website HamRadioProjects.com for all the book downloads, examples, and references. See the slides for the Pacificon talks here. Download the Arduino Sketch and schematics here.